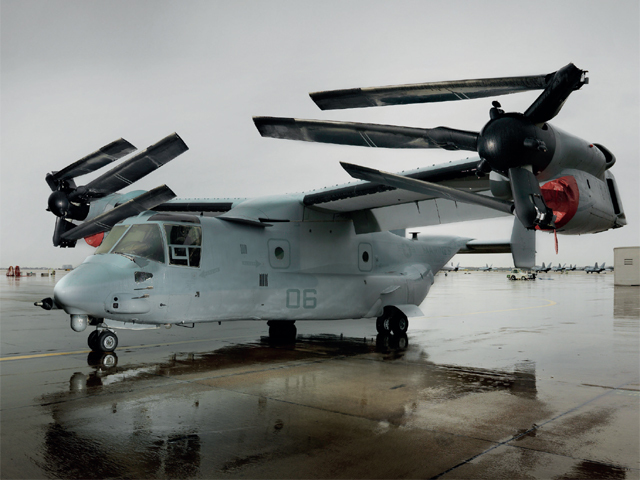 Two services utilise the Osprey: The Marine Corps uses the MV-22 and Air Force Special operations command uses the CV-22. 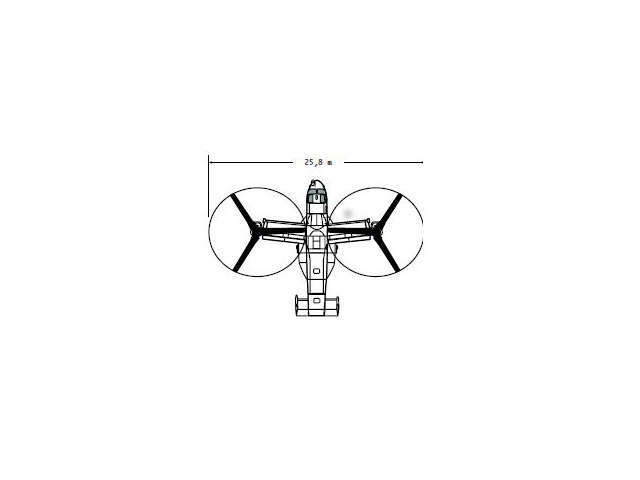 The aircraft are nearly identical, but each has several distinguishing features. The MV-22 carries almost three times the payload of the CH-46E Sea Knight helicopters it is replacing. The combat radius is more than four times that of the older Marine helicopter. Image credit: Justin Fantl. 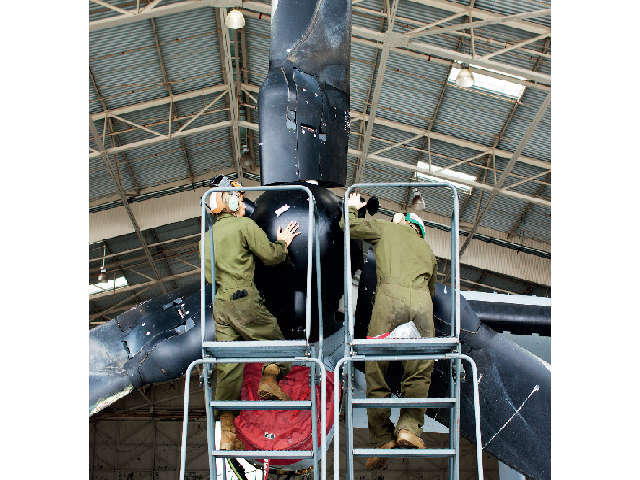 A Marine Corps maintenance crew works on the aircraft’s prop-rotors. The blades are jointed so they can fold when the aircraft is stowed inside ships. Image credit: Justin Fantl. The V-22 Osprey, haunted by fatal test flights, is redeeming itself in combat. But the battle to prove it’s affordable is far from over. Captain Art “Papi” Guzman, gaze fixed forward, strides through the hangar at Marine Corps Air Station Miramar in San Diego. The stoic pilot is focused on the day’s mission. His hard, square face probably wouldn’t flinch if a tennis ball bounced off his forehead. Guzman must haul 3 900 kilograms of high-octane aviation fuel 150 kilometres north, over the peaks of the Chocolate Mountains. The trip will take 20 minutes. A half-hour after landing, the two Marines riding in the back will convert an empty patch of desert into a refuelling station for Cobra attack helicopters that are conducting live-fire rocket practice. This training mission is ideal for Guzman’s ride. 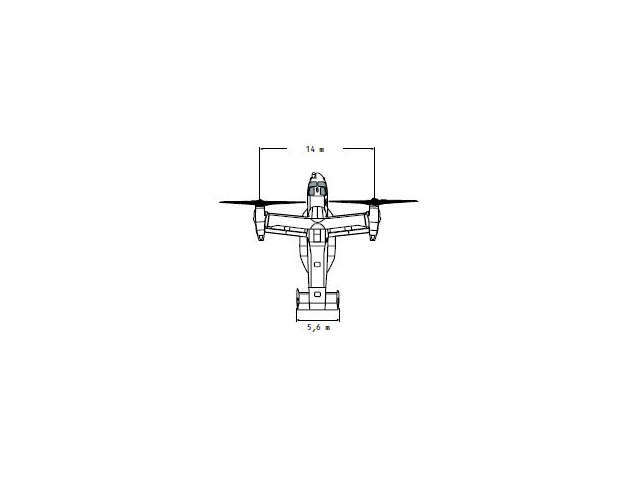 An MV-22 Osprey can carry 9 000 kg of cargo (or 24 troops) internally. No other comparable helicopter can deliver this much fuel as quickly; the V-22 goes twice as fast as the tandem-rotor CH-46E Sea Knight and it can transport nearly three times the payload. Two Ospreys have been charged with completing today’s task; VMM-161, the Greyhawks, are training for an upcoming mission to Afghanistan and the squadron needs flight time. Under a leaden sky that promises more rain, Guzman’s co-pilot and ground crews are prepping the Ospreys. Their rotors start to spin, the wash tracing intricate patterns on the rainwater pooled on the tarmac. No other modern military aircraft evokes the reaction generated by the Osprey. It’s an engineering marvel and a target of abuse. Crusading bloggers and politicians denigrate it; pilots and military brass say it is revolutionising the concept of air mobility. Regardless, the aircraft is here to stay. The US Marine Corps and the Air Force Special Operations Command both use Ospreys, and both will receive more for years to come. With its ability to shape-shift, the V-22 is a complicated aircraft. 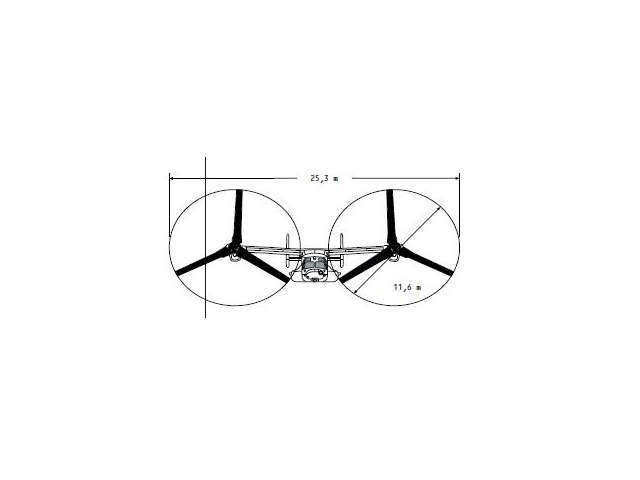 Kilometres of hydraulic and fuel lines run through the wings, and the fuselage must be tough enough to resist deformation despite the movement of the two 440-kilogram engines. Adding to the challenge, the propellers must fold so the V-22 can operate from ships. A litany of problems – leaking hydraulics, onboard fires and, in certain conditions, aeronautic instability – plagued the aircraft during its 30-year development. This troubled programme took a human toll: 30 Marines were killed in three crashes during testing. 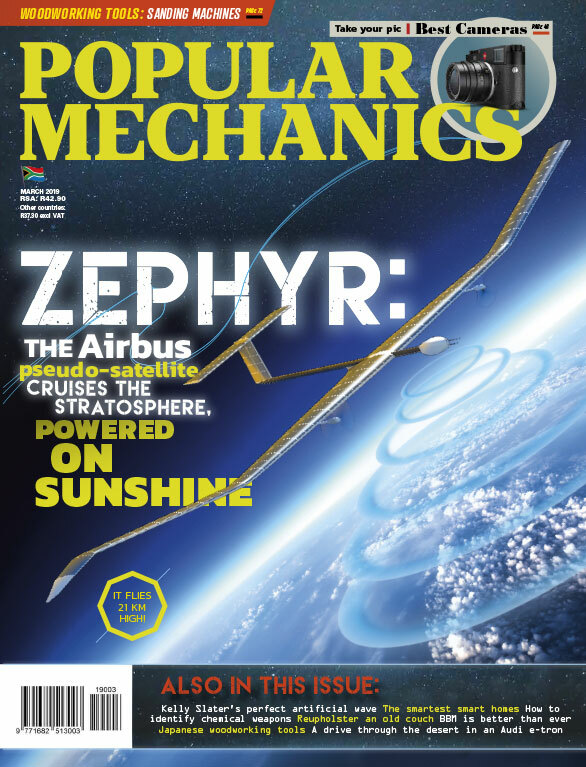 Engineers have systematically addressed the plane’s design flaws (see “A Legacy of Fixes”), but the media piled on to what they saw as an obvious villain; the abuse reached a peak in 2007, when a Time magazine cover story labelled the Osprey “A Flying Shame”. and “unsafe”. An April MV-22 crash during a training exercise in Morocco that killed two Marines will likely feed into this reputation. imaginable. There has been only one fatal crash in combat: in 2010 in Afghanistan an Air Force CV-22 touched down short of its landing zone, hit a ditch and flipped, killing four of the 20 aboard. “Over 10 years, Ospreys have been the Corps’ safest combat rotorcraft,” says Richard Whittle, author of The Dream Machine: The Untold History of the Notorious V-22 Osprey. The advantages that the Osprey brings to the battlefield have been displayed during deployment. Not only can V-22s carry larger payloads, but they can also cover more than four times the distance of the Sea Knight. For the Marines and special operators who rely on the Osprey’s speed, those are crucial capabilities. In 2010, a helicopter was wrecked during a raid in Afghanistan, stranding dozens of special operations soldiers who came under attack from small arms and mortar fire. When other helicopters were turned back by dust storms and the high peaks of the Hindu Kush, two CV-22s made the 1 500-kilometre rescue, soaring 4 500 metres and over the mountains. The mission returned 32 US personnel in less than 4 hours. A year later, an F-15 pilot who had crashed in Libya was rescued by MV-22s flying from an amphibious assault ship. The Marines returned the pilot to the vessel, 250 kilometres away, in just half an hour. Those benefits come at a steep price. The V-22’s research and development programme was supposed to cost just over R300 billion, but independent estimates predict that it will come to R440 billion. This price tag – about R800 million per plane, including development costs – becomes a bullseye each time politicians look for budget cuts. The USA’s 2010 bipartisan deficit commission proposed termination of the Osprey in its list of suggested savings. The US government’s proposed 2013 budget trims 24 aircraft (from 122 to 98) over five years, saving nearly R14 billion. But those orders could be reinstated during negotiations of the Pentagon’s contract with Osprey maker Bell-Boeing. The fact that the Osprey has escaped the budget axe’s deepest cuts confirms its improved reputation within the military. mission’s flight path over the Chocolate Mountains, which the pilots refer to as the Hill. Most of the de-icing systems in the squadron’s Ospreys are not working, placing the craft under Naval Air Systems Command-mandated restrictions that govern where Guzman can fly. This puts the mission in jeopardy. “The amount of ice up there won’t even degrade performance,” Guzman says. “I could punch through to (5 000 metres) and it’d be a clear ride to the other side of the Hill.” These rules are relaxed in combat zones, but extra precaution is taken during training flights. Late last year a report by the Pentagon’s Office of Operational Test and Evaluation noted that, from June 2007 to May 2010, the Marine Corps’ Osprey mission-capable readiness was only 53 per cent. Guzman stalks to the flight line and heads for his Osprey. He climbs through the door behind the cockpit and enters the cargo bay. It is stuffed with a chest-high fuel container, pump and hoses that will become the temporary refuelling station for the Cobras. The walls are lined with tightly secured bundles of exposed wires and hydraulic lines. The twin engines shake the aircraft as it prepares to rise. The graphite and glass fibre blades whirl just outside the cockpit windows, chopping air in a dark blur. Guzman’s left hand moves the throttle control lever (which governs the pitch of the rotors) forward, and with hardly a lurch, the MV-22 rises into the grey sky. The stubby windscreen wipers beat back sheets of rain as the aircraft climbs to 500 metres. After a few seconds Guzman plays his thumb across a wheel on the lever to change the angle of the nacelles. He descends to 1 000 metres, eyes constantly scanning the colourless mass. There’s no way through. “Well, we tried,” Guzman sighs into his headset. The temporary duty assignment will be his 30th in 19 years. “Every time we change places, the environment adds different stresses on the airframe,” he says. “The dust in Afghanistan clumps in different places than the dust in Iraq.” These conditions play hell with the Osprey’s performance. McCain cites Pentagon records that tally the V-22 engines’ service life at just over 200 hours in Afghanistan. The military estimated that figure to be 500 to 600 hours. The shortfall has more than doubled the cost per flying hour to over R75 000, compared with about R35 000 per hour for the tandem-rotor CH-46 Sea Knight the Osprey was designed to replace, he said. But those figures fail to account for the Osprey’s speed and size. 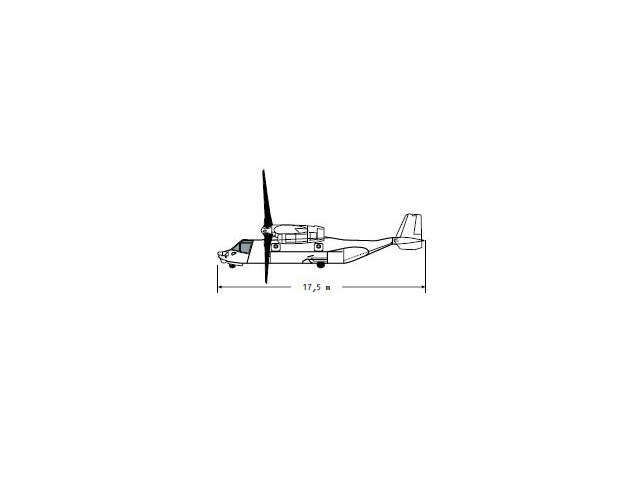 Whittle points to an internal Marine Corps analysis that crunches the numbers by passenger seats – 12 for the Sea Knight at a cost of R15 per seat per kilometre versus R8,50 for the 24-seat Osprey. The struggle between capability and cost doesn’t look the same on a spreadsheet as it does from the cockpit or an isolated landing zone. The truth is somewhere in between: the Osprey may be too costly to keep, but it’s becoming too useful to abandon. The most audacious feature of both versions is the engines, mounted on the ends of the wings and designed to pivot, so the aircraft can fly in aeroplane and helicopter modes. Pilots manipulate a thumb wheel to adjust the angle of the nacelles, which move in tandem. One way a special operations Osprey differs from the Marine Corps variant is the extra fuel tanks. The CV-22 was built with four additional fuel tanks in its wings. Auxiliary tanks can be rolled onboard both versions for extra range. The CV-22 can  y 900 kilometres on a full tank. But it often needs to refuel on return  ights from long missions. In the cockpit, a Traffic Collision Avoidance System supplies the refuelling tanker’s altitude and climb/descent information. The MV-22 carries almost three times the payload of the CH-46E Sea Knight helicopters it is replacing. 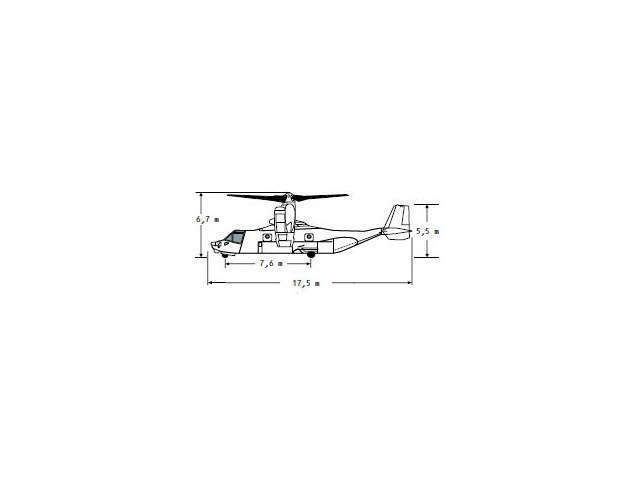 The combat radius is more than four times that of the older Marine helicopter. Titanium hydraulic lines leading to the nacelles used to rub against wire harnesses. This created holes in the lines that caused fires; in 2000, one such fire contributed to a crash that killed four Marines. Rotorcraft that descend too quickly at slow speeds can lose lift if the rotor dips too far into its own downwash. 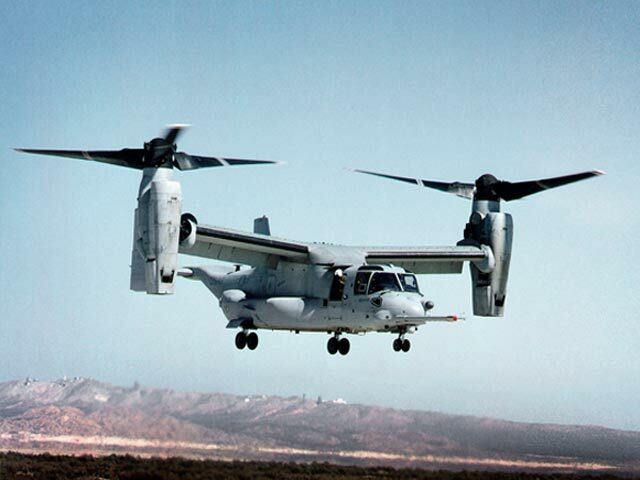 This is called vortex ring state – an Osprey in VRS can lose lift on one side and ­ flip; 19 Marines died in one such accident during the aircraft’s development. UPDATE: Ospreys have audio and visual warnings that alert pilots when VRS conditions start to form. Pilots can tilt the rotors forward to escape, if the aircraft has enough altitude to manoeuvre. 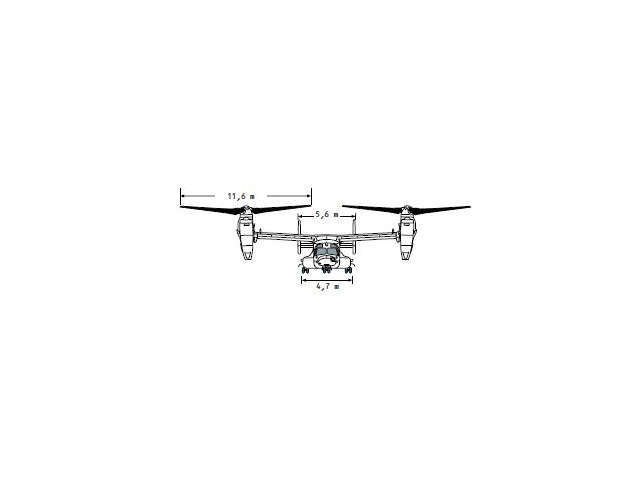 Ospreys ­ y into landing zones that are defended by enemy fire (hot LZs). Critics once complained about the craft’s lack of armaments. UPDATE: Some Ospreys now have 7,62-mm GAU miniguns mounted in their bellies; they are remotely operated by the crew inside the aircraft. When a helicopter’s engine fails, the rotors continue to turn as the craft plummets, which creates enough lift for the pilot to make a controlled landing. Ospreys cannot perform this manoeuvre, called autorotation. They have other ways to land in an emergency, says Special Operations pilot Brian Luce. V-22s can take advantage of the lift of the props and wings to set down safely. “I’d look for a ­ at space and do a running landing,” he says.